Peter Drucker is known worldwide as “The Father of Modern Management.” But he was also the world’s most famous and successful independent consultant. The methods developed by Drucker remain highly relevant and continue to be used in today’s organizations. 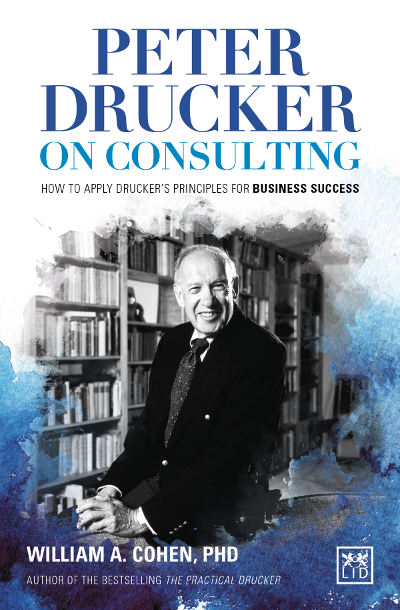 This book, written by Drucker’s first executive PhD graduate of the program he developed, is the first book to reveal in detail Drucker’s methods and ideas as a consultant. Jack Welch noted that his success at GE was based on Drucker’s consulting advice. Bill Bartmann became the 25th wealthiest man in America at one point. He, too, credits Drucker’s advice in helping with his success. This book is an encyclopaedia of Drucker’s consulting approaches and how and when to apply them. Any consultant will find this book invaluable. However, executives and managers will also gain new insight into Drucker’s thinking and methods, and why they continue to have such tremendous influence over today’s organizations. A first guide ever to the consulting principles and techniques of Peter Drucker, the world’s most revered management thinker. ● Drucker was not only the greatest management thinker, he was also a hugely successful consultant. ● Heavy demand for new and original books on Peter Drucker. This is the first book about Drucker as a consultant. ● Includes Foreword by Jack Welch, former chairman of General Electric, and essay by Jim Collins. ● Major marketing and PR campaign – the author has a very wide global fan base. His blogs receive 300,000 views each month.